Let me just tell you in case you were unaware – if you wake up at 5:30 in the morning, it usually makes for a long day. One doesn’t get up at 5:30 in the morning for the fun of it. It usually involves plane flights or lengthy drives or spring cleaning or some kind of less-then-savory activity that turn into all-day affairs. And if the day you happen to wake up at 5:30 in the morning happens to be a Sunday, it makes for a very long day. Now combine a 5:30a Sunday wakeup call with a cab ride to Brooklyn, a drive to the Bronx, running a pretty much vertical 10K (thanks Riverdale Y!! ), a stop at a greasy Greek diner, a hellish one and a half hour drive back to Brooklyn (thanks NYC Century Bike Tour!!) and a subway ride out of Brooklyn and back to my little SoHo pad, it makes for a very, very long day. LLLLLLOOOOOONNNNNGGGGG. And of course the last thing I wanted to do on what might possibly have been the longest Sunday of my life is to whip up a respectable looking and tasting dish to take to a summer kickoff barbecue later that very same Sunday. No problem! These deviled eggs were a cinch to make and I did everything the night before (a nice, reasonably long, sunny Saturday) except assemble them. And look, it’s not like I am fishing for praise on my cooking, err assembling in this case, but these babies give a HUGE presentation and taste pay off for very minimal work and were a hit at the barbecue. You can be really smart about them and cut down on prep time too by using good-quality, pre-pickled beets (see note below) and they come together in no time. The most important step here is clearly the egg-boiling part, for which I always turn to the flawless Ms. Heidi Swanson and 101cookbooks for the method. Until I found this recipe, I had been brutally over-boiling my eggs to the point that the whites were rubbery and tough and the yolks were chalky and dry. These 101 eggs yield springy whites and luscious, just set yolks that are the perfect set up for a creamy filling. I felt the need to add lemon zest. I am not at all sure why, but I did and I think that was the key to this dish, adding a really fresh, summery flavor. You may actually want to throw your own barbecue just to have an excuse to make these. Enjoy! *PS, be sure to turn in next week for an account of – Tamales Loco! – my hilarious attempt to re-remember how to make the tamales of my childhood. 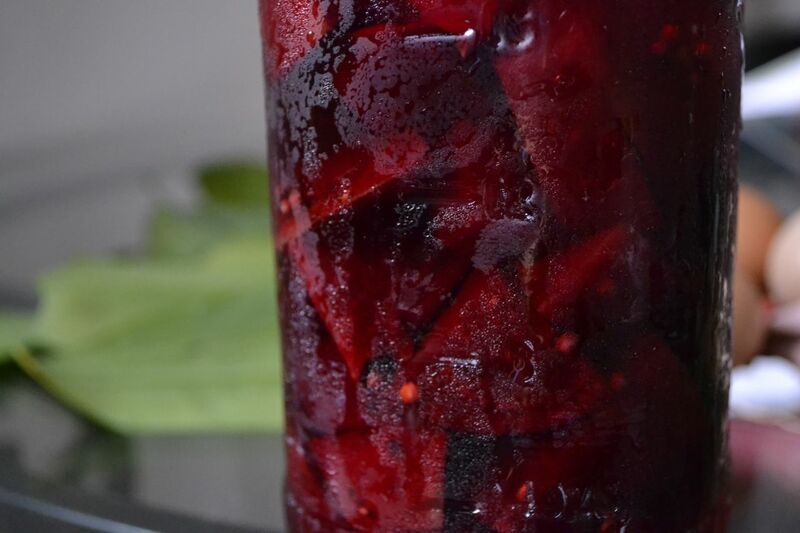 I had homemade pickled beets from canning last August, so I did not pickle the beets to the recipes specifications, however I left the recipe for those who do not have pickled beets on hand. 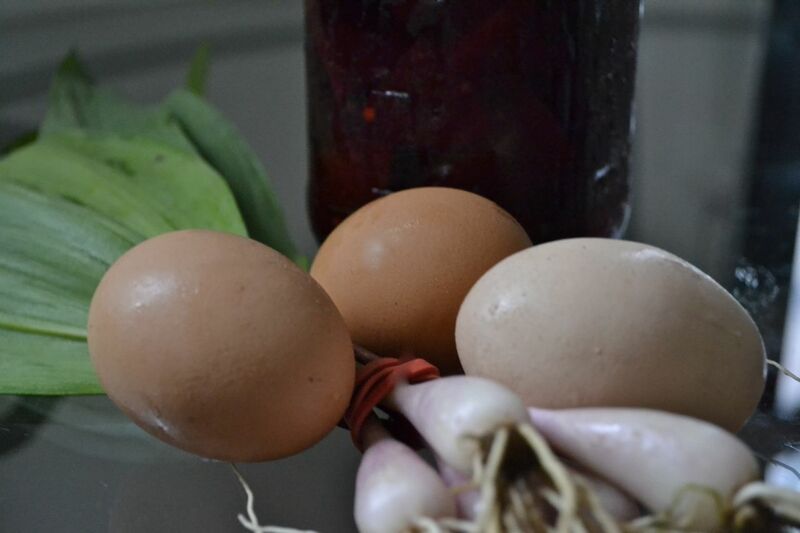 Any artisan pickled beet with work too in a pinch, like Rick’s Phat Beets or The Brooklyn Brine’s Fennel Beets. Heidi’s method to hard boil my eggs is of course the best. It’s the only way I’ll eat them now.Adapted from Bon Appetit Deviled Egg recipe, published October 2011. Active Prep Time: 45 minutes, Inactive Prep Time: 9.5 hours; Serves 12. Preheat oven to 400°. Wrap beets in foil, crimping tightly to seal; place on a rimmed baking sheet. Roast until tender, 45–55 minutes. Let stand until cool enough to handle. Peel beets and cut into 1″ slices. Transfer to a wide, shallow container. Bring vinegar, sugar, coriander seeds, mustard seeds, cloves, bay leaf, 1/4 tsp. sea salt, and 1/2 cup water to a simmer in a small saucepan over medium heat. Simmer for 10 minutes; pour liquid over beets. Let cool to room temperature, then cover and refrigerate overnight, turning occasionally. Slice eggs lengthwise in half and spoon yolks into a bowl. Mash yolks with a fork, then stir in the mayonnaise. Press mixture through a strainer into a small bowl. Add 1 Tbsp. strained beet-pickling juice, lemon zest, mustard, a pinch of salt and a grind of pepper. Spoon or pipe mixture into each egg white. Finely dice enough drained pickled beets to yield about 1/2 cup (reserve any remaining beets for another use). 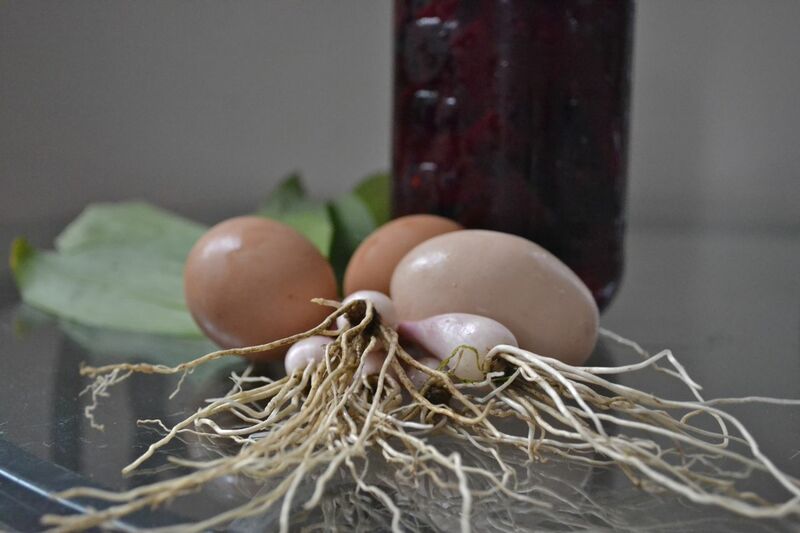 Garnish each egg with diced beets and snipped ramps. 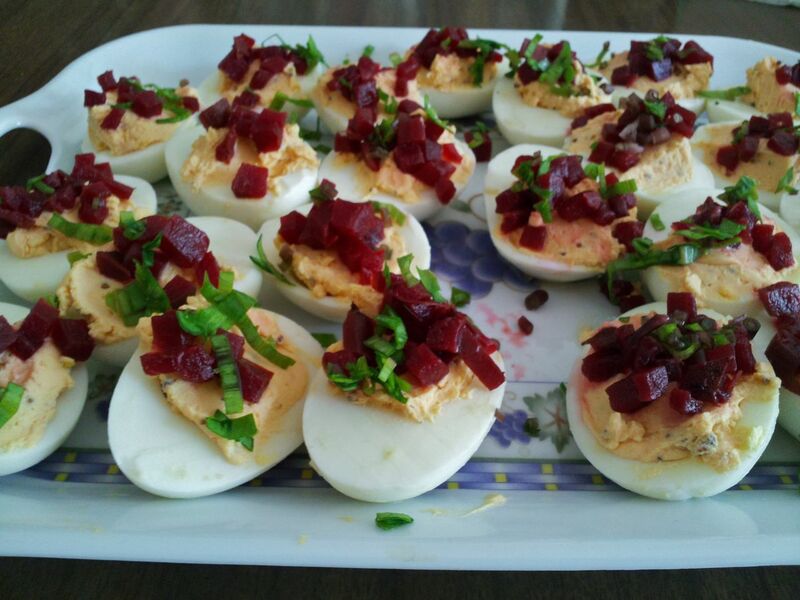 Pingback: Gourmet Deviled Eggs – A Heavenly Appetizer | Gourmet Foods For Folk's who enjoy Food! 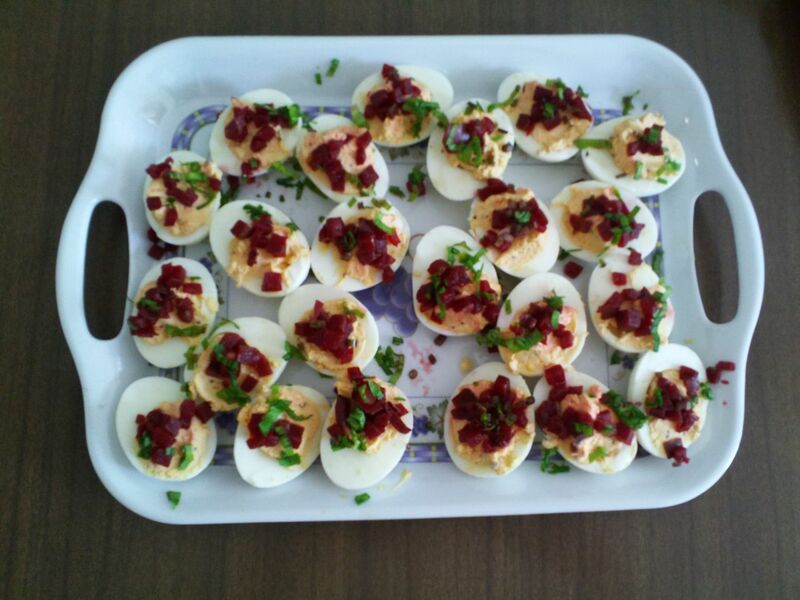 Pingback: Deviled Eggs Recipe and Video | Gourmet Foods For Folk's who enjoy Food!